The Hawker Cygnet was Sydney Camm's first design for Hawkers, and it was the company's entry for the Light Aeroplane Competition organised by the Royal Aero Club in 1924, for which the Air Ministry offered prizes to the value of £3,000. Two Cygnets, G-EBMB and G-EBJH, were built for the competition, with entry numbers 14 and 15. These were powered by 34 hp British Anzani and 34 hp ABC Scorpion engines respectively. 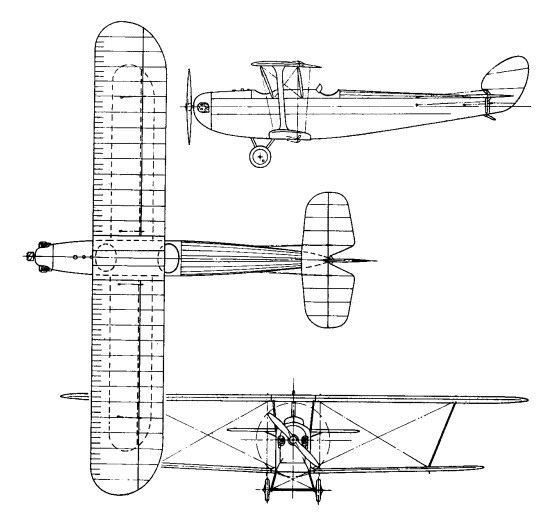 It had drooping ailerons which can be wound down as flaps. But for valve trouble, No 14 might have won first prize, but the two Cygnets finished in 3rd and 4th places. The next year EBMB won the 100 mile International Handicap Race at the R.Ae.C's Lympne meeting, and in 1926 the Lympne Light Plane Competition brought the two Cygnets together once more, both now re-engined with the 34 hp Bristol Cherub, and EBJH now belonging to the R.A.E. Aero Club. Flying as No. 6, EBMB, in the bands of P. W.S. Bulman, won the Daily Mail's £3,000 first prize. EBJH came second. Following appearances at a number of subsequent events, including the 1927 Bournemouth Easter Meeting, EBMB was put into storage by Hawkers. After the Second War the Cygnet was completely restored, and from 1949 onwards it flew at several Royal Aeronautical Society Garden Parties. EBMB, 1972, went on permanent display at the Royal Air Force Museum, Hendon.